My family loves them - so much that they have turned into our chips of choice. So when we were given the chance to try their new flavor we were very excited! Check out the NEW SIMPLY 7 flavor! Quinoa flour is a flour produced from quinoa, a grain-like seed native to the Andes of South America. Quinoa has a very high protein content, naturally gluten-free, and high in dietary fiber. Let me tell you these chips are DELICIOUS! So good that my family did not want me to share with my fellow employees at the hospital! When I went out the door with my dip and chips on Fat Tuesday...my hubby yelled where you goin with that! The chips go great with so many different dips. 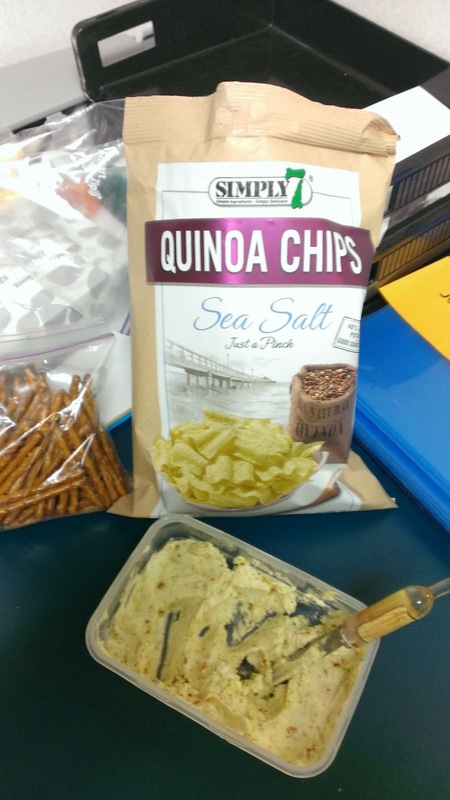 I made a VaVa Veggie dip for Fat Tuesday and picked Sea Salt Quinoa Chips! The staff at the hospital loved it! I showed everyone the Simply 7 Website and how to locate a store near them to purchase Simply 7 products. I stressed that all of the different flavors tasted as great as the Quinoa Chips. One of the staff members was really excited about Simply 7 - her young daughter was recently placed on a gluten-free diet by her doctor. She has been searching for fun gluten-free snacks! I told her Simply 7 is her answer. These chips are so good for you and taste so good that for some reason I am feeling the need to share with the world the greatness of Simply 7! 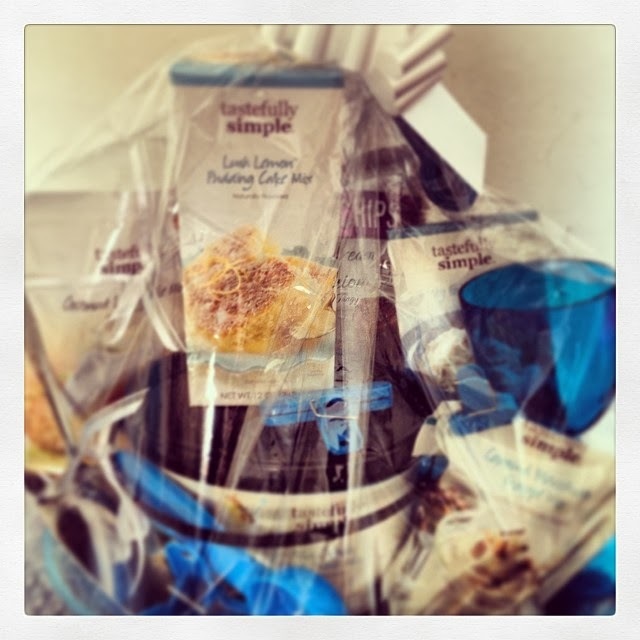 Last Sunday at the Kansasville Pancake Breakfast I donated a basket full of great tasting food items and I added a bag of Simply 7 Quinoa Chips! I was telling everyone about the great taste of Simply 7 chips! I gladly shared their 7 core standards which I feel sets Simply 7 apart for all chip companies. One girl looked at her Mom and said "Those are the chips Isa eats." - "Mom they are good." I right away told the Mom where she can buy Simply 7 in our area. Simply 7 makes finding a location near you so simple! Click on the STORE LOCATOR button on the top right of their website. Put in your location info and you have stores near you - SIMPLY! 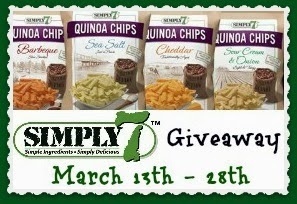 I am honored to offer a great giveaway for Simply 7 Chips! Simply 7 will be sending 11 WINNERS a CASE of CHIPS!!! 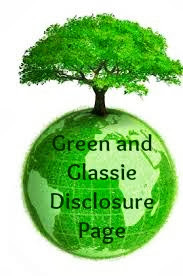 Giveaway starts on March 13th - come back and enter right here on Green & Glassie! I would love to try these chips! I love that they are made from healthy ingredients! Wow, it's hard to find a chip without a lot of nasty additives! I'll be looking for these next time I'm grocery shopping. Oh these looks so delicious and healthy! I love quinoa and I haven't heard of these chips! Thanks for sharing! Quinoa chips are yummy! I love dipping them in Guac. This is a great natural chip. Delish! Those chips are right up my alley! I love snacking on things like that when I am home during the day! I am going to have to keep an eye out for these chips. I would love to try the quinoa ones. Definitely need to try these! My kids are chip hounds, and if I don't watch them closely enough an entire bag disappears in an hour. Would be nice to know that what they're consuming is healthy. I'm always looking for a healthier snack alternative and these look delicious. I will be on the lookout for these. I just won a box of these and by far my favorite was the Dill Flavored chips - which totally surprised me. These are totally worth getting! They look good. I have never tried Quinoa before but I'm always open to new healthy snacks for the family. These sound so good! And good for you too! I'll have to see if they have them at my store. I have heard so many amazing things about the Simply 7 company! I would love to try their BBQ chips :), it would be a guilt free snack. Yum. These chips look amazing. I wish I could eat those hummus chips right now. Yum! These actually sound delicious. I wonder if they carry them at my store? I have never heard of them before. I LOVE these chips! They are so yummy and i love that they are so healthy! YES! So excited! I have never heard of these and I know I will love them! I have been hearing such great things about these but I have not been able to find them. Oh, I LOVE Simply 7! They have such great products! I bet my daughter would like these. She loves finding new tasty gluten free snacks. These look so good! Looking forward to your giveaway! These chips would be the perfect snack! The flavors look delicious and I bet they are even better with a little dip. These chips look really good! I've had quinoa chips before and I actually really liked them. Thanks for sharing! I am always on the look out for new chips to try. It is hard to try something when you don't know it you are going to like it or not. Thank you for the recommendation. I love that these are all natural and not full of gross preservatives and chemicals! I am always looking for snack options that aren't unhealthy, thanks so much for sharing! I haven't heard of Simply 7, but I love trying new chips. Potato chips can get boring so it's nice to change it up! I'd love to try these chips! They look amazing! Especailly the cheddar ones! Oh, I loved the original Simply7 Chips! I bet these are so delicious! Haven't tried these but I'm all about natural junk! So yes! I would love some! Pomegranate chips? Okay, I will have to taste these to be made a believer. I am always looking for the next wonderful thing that is natural to bring to my family. I haven’t tasted any Simply7 product, so I’m game! Pom chips?? Did you say Pom?? I am entering!! WIN WIN!! I love hearing about new healthy snack products. I will be back to enter!!! these sounds great, nice selection of flavors too! Oh, I love quinoa! I need to try these! Yum. I would love to try these. 11 winners! Wow! I hope I am one of them! Wow I Must Try These Chips! I was recently turned onto QUinoa, I have a bag sitting in my pantry but I haven't got around to use it yet. I had no idea they also came in chip form. I have eaten Quinoa on numerous occasions. I never knew it could be a snack food! I need to try these. I am always looking for healthier chips because I'm a chip fanatic! Never heard of these but would love to try them since I already love Quinoa. The cheddar one sounds great. Never tried these before! I need to see if we have these at our store. They all sound like something I would love to eat with my salsa. Quinoa is such a superhero! I love that it can be made into so, so many things. Oh my daughter was actually looking for something like this that was more healthy. I have never tried these before but they do sound like great chips. I'll have to look out for them at my local commissary. I love chips and those look really delicious. I'll look for it in the supermarket. This look really good! I haven't ever tried quinoa chips! mmm I bet those are so, so good! Going to look for them this weekend! I haven't even heard of these before. Thanks for sharing, they look yummy! I bet my husband would like these! He's all about healthy snacks! 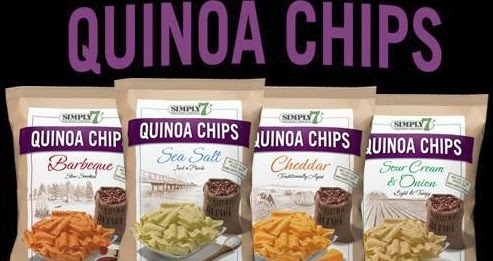 I've never tried quinoa chips! I wonder if I'd like them. Please be aware that since Simply 7 has updated their nutritional information that in reality, the carbohydrates are nearly double and there is only 1 gram of protein. They are now no better than a regular potato chip.